MONTEREY (AFP) - A scientist who mapped his genome and the genetic diversity of the oceans said Thursday he is creating a life form that feeds on climate-ruining carbon dioxide to produce fuel. 18 months to revolutionize the energy industry. At least he's not thinking small. After Anna Wintour leaves, guest editor, artist Scott King gives away Vogue for free and includes articles such as: Angry Scarlett Johanssen, 635 Poor People Upside Down, Karl Lagerfeld Discussing Various Cancers, and a budgie, "chillingly declaring that 'I am God'". 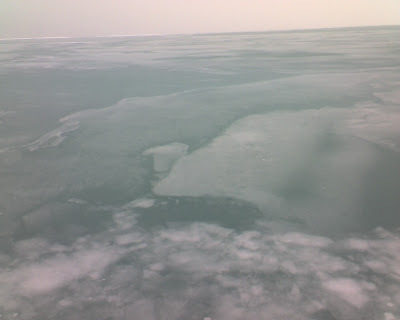 Lake Michigan in its pre-spring incarnation. This looks like a picture taken from a thousand feet up, but was in fact taken from an altitude of about 6'0". Warren Ellis put me on to the new Burial album, Untrue. Burial: The motion tracker, yeah, and the dropship, the sentry guns. My big brother would play that sound to me when I was little, and tell me the stories from the film. He recorded it on a tape. He would tell me about that motion tracker sound, and ‘Alien’ and ‘Aliens’ are some of the scariest films. But he would only show me the bit where they were loading up the weapons, but he’d say, ‘you’re too young, I won’t show you the rest, but I’ll tell you about it’. I love the sound of the motion tracker, you can feel the fear of the empty spaces ahead, it's like sonar. I like Blade Runner but I’m only obsessed with one scene in it, the bit where he’s sitting at those cafes in the rain. I love rain, like being out in it. Sometimes you just go out in the cold, there’s a light in the rain, and you’ve got this little haven, and you’re hanging round like a moth – I love moths too and that’s why I love that scene. 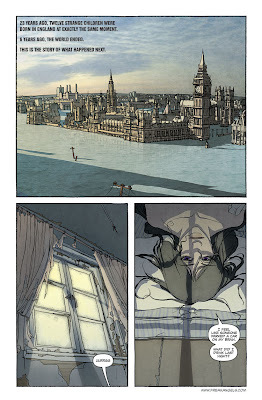 Warren Ellis's new weekly webcomic is up and running deliciously.